Tagore Academy is an educational and social welfare Society registered under Societies Registration Act of 1860. It was founded by late Prof. Balwant Singh Jain, M.A. B.T in 1961. 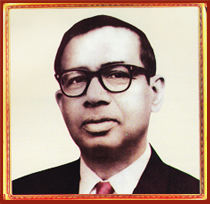 Prof. Jain was a specialist in child education and a great social reformer. The motto of the Academy ‘Respect the Child’ is just not three words. It truly reflects the philosophy of the Society about child education Anyone who came in his contact was very much impressed by his simplicity, idealism and humanism. He established Tagore Montessori School at Bara Tooti and named it after the great Novel Laureate Guru Ravindra Nath Tagore as Prof. Jain was very much influenced by his teachings. It was indeed a pioneer effort as then people hardly knew the concept of nursery education. The School continues to be rated as one of the best schools in the walled city of Delhi. Over the years, Tagore Academy has grown admirably. It added another feather in its cap by establishing Tagore Modern Public School at Motia Khan, New Delhi which is now a full-fledged English Medium Secondary School recognized by Directorate of Education, Government of NCT of Delhi vide letter no. 2486 dated 29.03.1996 and is also affiliated with Central Board of Secondary Education vide registration number UCU0333. The School building was inaugurated on 11th August, 1990 by the then Hon’ble Lt. Governor of Delhi Air Chief Marshal S. Arjan Singh in the distinguished presence of Dr. Vijay Kumar Malhotra, M.P., Late Shri Kalka Dass, then M.P., Dr. Bhai Mahavir Ex-M.P. and other Dignataries, prominent Principals, Educationists and other prominent citizens of Delhi. The school welcomes children from all walks of life and provides equal opportunities for each one of them. It caters to lower-middle and middle income groups and has a very moderate and reasonable fee-structure. The school is housed in a 4-storey building on 1150 sq. yards DDA plot and is equipped with all modern facilities, apparatus and infra-structure. Apart from very well ventilated 14 class-rooms with proper furniture and fixture, it has a well equipped Science Laboratory, a Computer Laboratory equipped with the latest 30 Core to Duo Pentium-4 Computers and a Library with large number of books, journals and newspapers. Tagore Modern Public School facultys . Tagore Modern Public School photo gallery.